Revealing module content on hover can have some helpful benefits. 1) It can be a great way to have a more compact or elegant design of your web page initially. 2) It saves space. 3) It can entice users to interact with your page. 4) It looks cool :). The basic idea is to show only a portion of the module content (like a teaser) which makes it enticing for visitors to hover over to see more. Once they do hover over the module, the entire content is revealed with a smooth hover effect that opens and closes like a shutter. 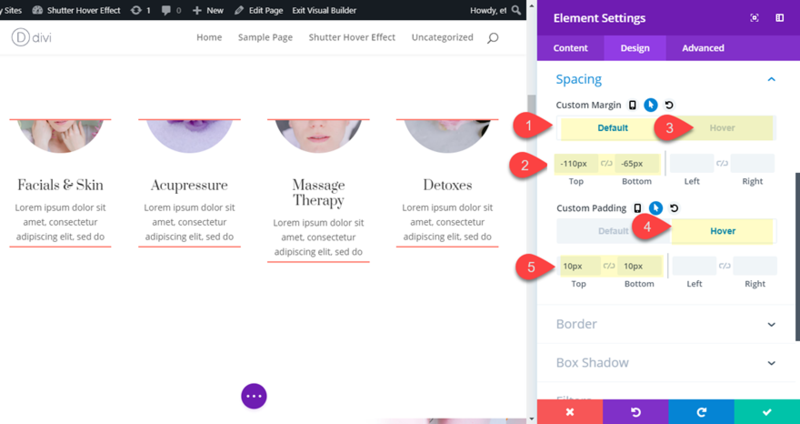 In this tutorial, I’m going to show you how you can reveal module content with a shutter style hover effect using the Divi builder. Here is a quick look at what we will be building together. 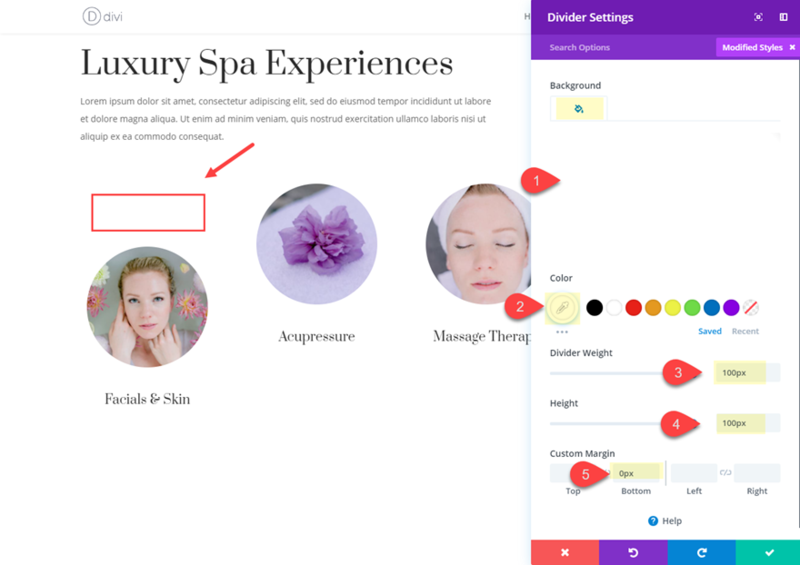 To get started, create a new page, give you page a title and then deploy the Divi Builder to build on the front end. Select the “Choose a Premade Layout” option. 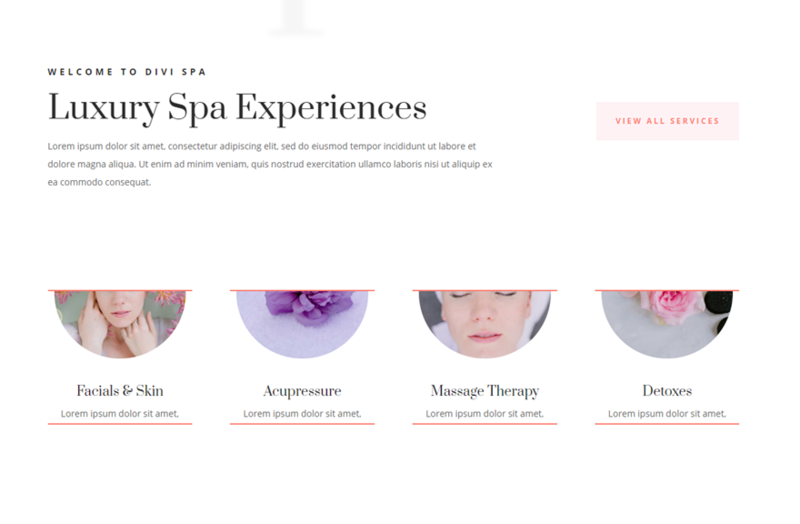 Then from the Divi Library popup, select the Day Spa Layout pack and click to use the Landing Page Layout. Once the layout is loaded onto the page, you are ready to start! 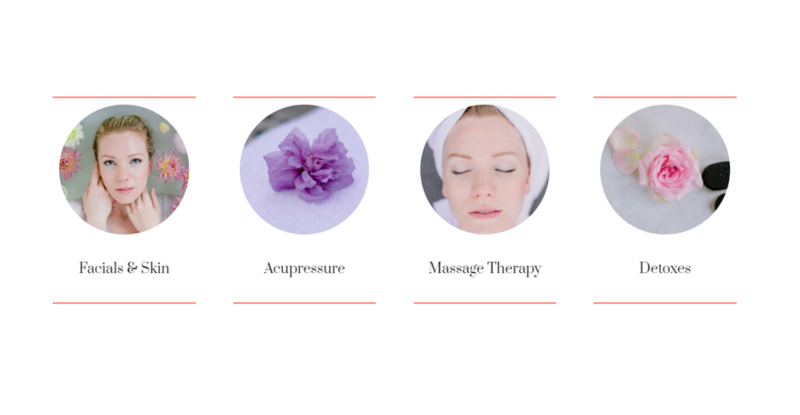 Scroll down the page to the section Titled “Luxury Spa Experiences” with the four blurbs. We will be using the row with the four blurbs to kickstart the design. Our first step is to add dividers above and below the blurb module in order to hide our blurb content behind. You can think of these dividers as of shutters of a window that will open and close on hover. The white background matches the background of our section since we don’t want to see it. Make sure the divider weight and height are the same. Then jump over to the content tab and give the divider an admin label “orange divider”. 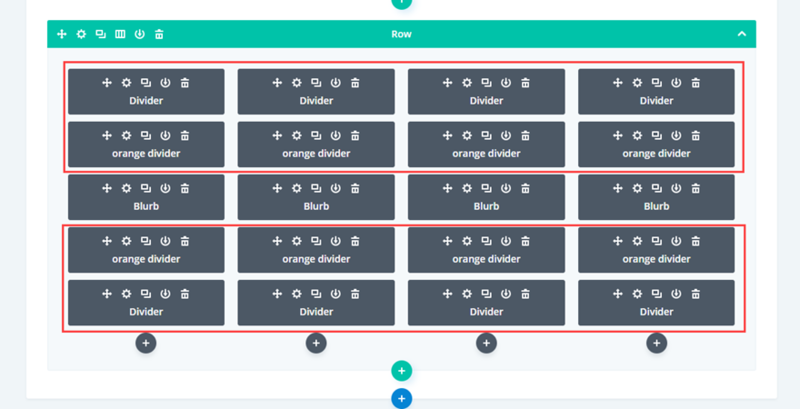 This will help distinguish the divider from the previous (white) divider when we use the wireframe mode to copy and paste the divider into the other columns. In wireframe mode, find the row containing the blurbs and the dividers we just created. 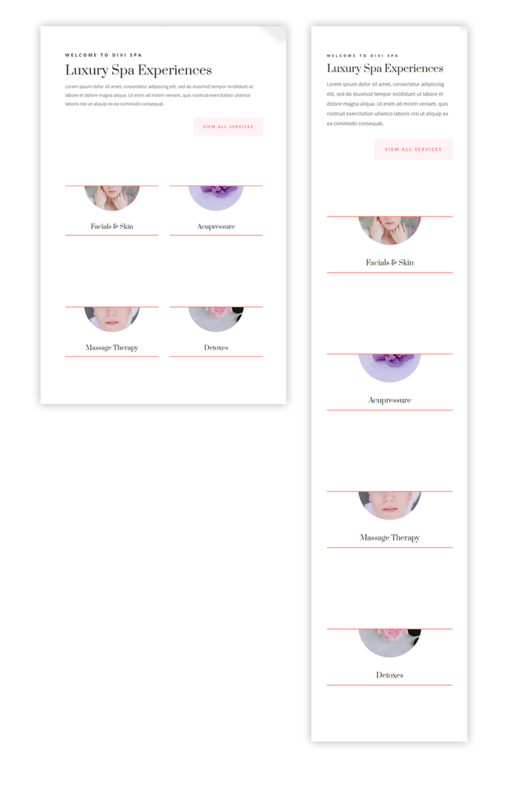 Then copy and paste the divider and orange divider above and below each of the blurbs so that the final result looks like this. Next, go back to the desktop view (shft + w) to finish the design. You page should look like this. 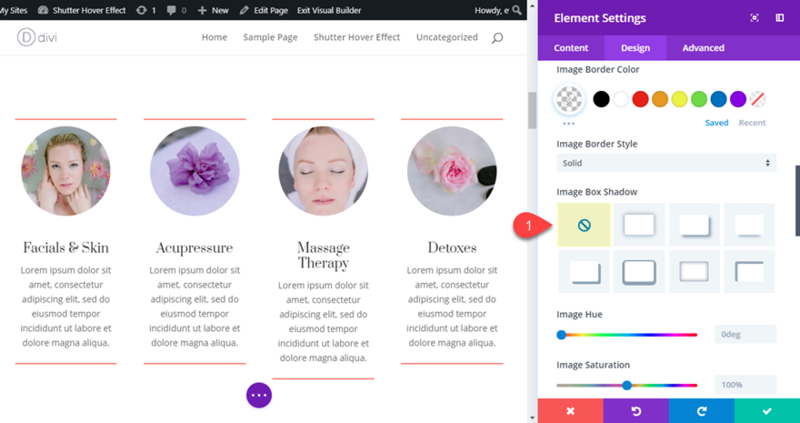 Now that you have all of the dividers in place, it’s time to edit our blurb modules with a few style adjustments including a custom margin to create the shutter style hover effect. First, use multiselect to select all four blurb modules. To do this simply hold ctrl (or cmd) and click on each module. Then open the settings of one of the modules to deploy the element settings modal. Under the content tab, add a few lines of mock content. Then disable the image box shadow altogether. To create the shutter hover effect, we need to add negative top and bottom margins to hide the content behind the dividers by default. Then we set the margins to 0px to reveal the content on hover. To do this add the following spacing. You may need to adjust the negative margin values depending on how much content you have. For example, you may need to have more negative margin for longer text content. Now check out the result so far. Notice the top and bottom of each module is hidden behind the dividers until you hover over them. Open the row settings and equalize the column heights. This will make sure the modules stay vertically centered within the column, giving us that upward and downward shutter effect. To stop the hover effect from pushing down the page content below, we need to stop the row from growing in height with each hover. To do this we must set a fixed height to our row on desktop. 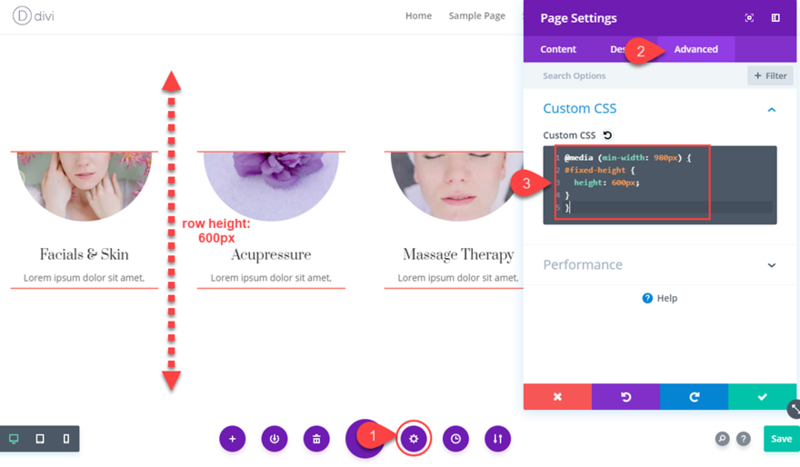 Because the height will be fixed, you will need to make sure that the height of the row is high enough to accommodate for the height of the blurb content in its hover state. However, you don’t want to make it too high because you will leave too much blank space above and below the modules. In this example, I’m going to set the row height to 600px. But, since we only want the fixed height set on desktop only, we need to add some CSS to our page settings using a media query. This gives your row a fixed height of 600px on desktop and stops the hover effect from pushing the rest of the page content downward. Check out the final design. And here is the shutter hover effect. This shutter hover effect is a creative way to tease your audience to look for more information about your different services. And with the magic of Divi and a few snippets of CSS, the final result is pretty elegant. I’m sure there are many more applications to this shutter hover effect since you can use any module you want. Feel free to explore some exciting new designs of your own, and don’t hesitate to share them with us. I look forward to hearing from you in the comments. How this effect con work on mobile if they haven’t the pointer?! Most mobile devices will trigger the hover effect when touching the element. But in most cases, I suggest disabling the hover effect on mobile anyway to avoid any problems. I have been reading that text hidden in tabs or so, get inferior SEO value. 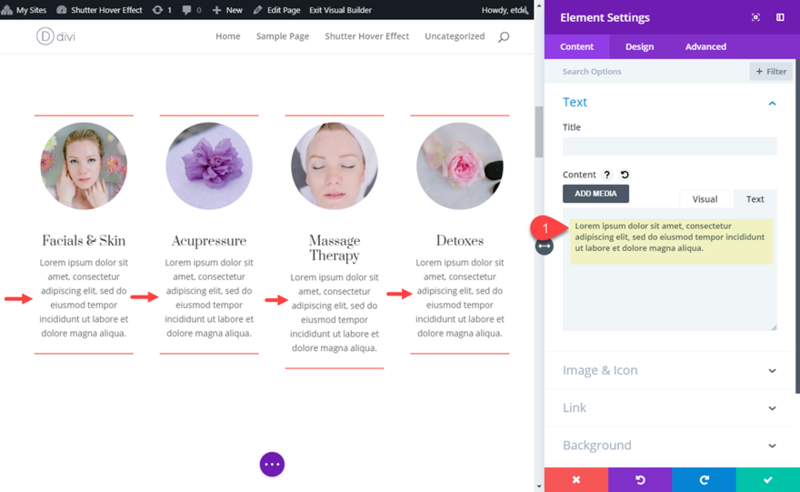 If it is so, do you have any opinion about the SEO value of the text in the module which is hidden behind the dividers until you hover over them? Interesting effect. Could there not be something else covering the upper half of the circles than the white divider? Some text, another image? Thanks! Image -> Reveal Text or the reverse would be great. Yes. You definitely could. However, there may be a need to adjust your z-index value for those elements that will be hiding the content. For example, if you use a text module, the contente will show through the background. I was reading one of your posts and now my doubt is cleared when I saw this line ” be sure not to overuse LSI, since that is just as bad as keyword stuffing” I did not see comment box there so I am writing here to say – thanks…. I did not find this information anywhere else and I was doing a mistake. Fortunately, I came to your blog and I learned something new. Keep it up and best wishes for you.